Very often Its lime scale that has caused the damage to plumbing and heating fixtures and appliances. We live in a hard water area as you know, so you should consider having a water softener installed. Those who have one wouldn’t be without it! The day to day benefits are obvious and impressive but additionally it saves a lot of money. Typically paying for itself in two years! 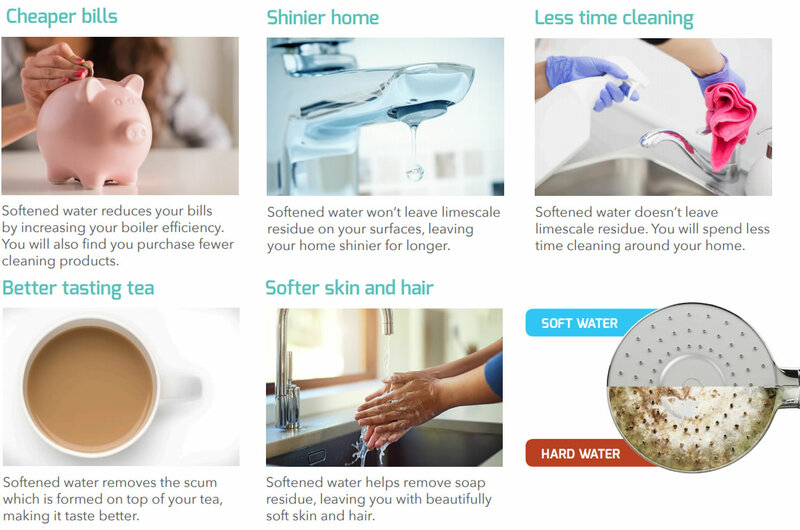 One softener stands out to me as the obvious best choice and I’ve Copied below a link to their site. Do watch all of the videos if you can, they’re really informative on the benefits of installing a softener. Click here for more information and informative videos. ‘Dualflo’ Water Softeners. The ‘DualFlo’ manufacturer, especially emphasise the benefits to us as we use water around the home – washing etc. But I want to add that there is a huge benefit for all of the unseen parts of your plumbing system, toilet cisterns, header tanks, Tap valves and washers, Washing machine and dishwasher working parts & hoses (No need for Calgon!) and especially your hot water production, weather a Combi boiler or stored cylinder and the heaters within electric showers. The life of all these will be extended and breakdown issues, related to water scale damage, virtually eliminated.